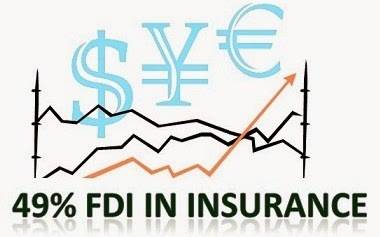 The Modi-led newly formed government is all set to raise the Foreign Direct Investment (FDI) in insurance sector to 49% from existing 26%, with two riders - all companies will have to provide health insurance cover, and voting rights of foreign firms' nominees on boards will be limited to 26%. The Insurance Law (Amendment) Bill has been pending with the Upper House of the Parliament since year 2008, as the then opposition party BJP had been opposing this, arguing it would expose the sector to global vulnerability. The government is working on a three-pronged strategy to make health care affordable.“While allowing up to 49 % FDI in insurance, we will mandate insurers to offer health insurance cover. They are willing to do that. Second, we are considering a higher tax exemption on health insurance products. More products and players should be in the market. Third, there should be some regulation of charges levied by private hospitals,“ an official from the ministry said. The government might follow a gradual approach to raising FDI ceiling in insurance, starting with non-life, health and then life insurance. The minimum paid-up capital for health insurance is Rs 50 crore, unlike Rs 100 crore for other insurance segments. The government is also planning to bring a mechanism to ensure private hospitals don't overcharge patients.